about this book: In scenes that shift from New York to Moscow to South Asia, my novel explores the essential natures of three ordinary men whose lives, while appearing to barely touch, will produce a butterfly effect with the explosive power of C4. I'm asked: What has inspired me? Well--anger. While America has had its very good moments, the moral centers of Western countries, including ours, have always been diplomatically shifty and adaptive when indulging in the cynical creation of wars in the name of national interests. Often supporting dictators in the violent suppression of free expression, when said interests were basically the privatization of someone else's property; with rich old men beating the false drums of patriotism and sending other people's children into the resulting maelstroms. An old story. "…may we never confuse honest dissent with disloyal subversion. Whatever America hopes to bring to pass in the world must first come to pass in the heart of America. When people speak to you about a preventive war, you tell them to go and fight it." Was anyone listening? Well not lately. As I recalled the imperfect heart of America, however short of its goal it fell, I believed it always struggled to perfect itself. No longer. Washington has become bank-and-corporate-driven and lobbied to death; a circular self-feeding establisment that has succeeded in executing an enormous shift of our countries wealth from the taxpaying pockets of hardworking Americans into the hands of the elitist few. Money of the wealthy moves offshore untaxed. Members of Congress used insider trading until they were caught--deer in the headlights. Wall Street screwed our public pensions and politicians want to cut what's left. Whistleblowers are deemed traitors while the NSA is unlawfuly tracking our every move, and our Gov employs billionaire contractors who provide deep intelligence and the "security" of private armies. Meanwhile, we "enjoy" a so-called Democratic adminstration that, no doubt, will soon employ drones to peek into our bedroom windows. Enough. My inspiration rant is more in depth at my website. The above list of angry complaints strongly suggests that in America the fix is in. It does not reflect the actual direction of my novel, but merely the flavor of the the systemically corrupt and potentially dangerous world through which my characters move. While Frank Driscoll is the anchor, Joe and Charlie have equal importance in terms of how they lead, and are followed by me. All three are flesh and blood and flawed, especially Charlie, and in the chaos of an unruly world, from radically different starting points, none follow a simple line from A to Z, but rather move outward in different directions, engaging other characters into newer, ever more dangerous, situations. It took me four and one half years to research and write this novel and there was no hard part to the process. For me, research and writing are two of the most pleasurable activities. In my "Word Copy of reference" I have seventeen pages of listed urls, each URL representing a path to an item of research. I expanded my knowledge of facts but essentially learned nothing new about today's world. Regarding my novel, while uncertain of how to get there, I knew the endgame, even if my characters didn't. Difficulties arose when I was faced with having to write a synopsis. A seemingly impossible task of reducing a large novel to a few sentences, hopefully succeeding after writing about thirty-five versions; then having to learn how to produce and market an eBook—consuming time that could be better spent writing! And while I studied web development, people under thirty have a serious advantage, for the conceptual grooves of my brain were formed before the advent of television, never mind the digital world. 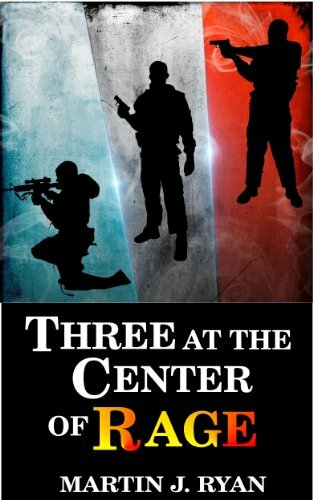 The title of the novel refers to the fact that each character at a given point is staggered and close to being overwhelmend by his rage, and it is only when he moves to the center of it, his rage, embracing it, that he finds his equilibrium Thus the title: Three At The Center Of Rage. Regarding genre, my novel does cover the territory of crime, suspense, and thriller, but readers who are looking for the tidy package, the perfect genre fit--this might not be the book for them. I wrote for me, not the genre. My novel is psychological, exploratory and strongly character driven. A friend suggested I add the tag: literary. In the end, I think what I wanted to say to my readers was—Wake up!